Vaynerchuck has since built himself a sizable empire of influence. I read somewhere that he is the most followed wine critic after Robert Parker. I can’t speak to whether or not those following him are doing it for the wine or the antics, but I can say that this recipe, adapted from one in Food and Wine’s feature on him last month, is the best that I have for the holidays. The dark maple syrup rounds out the nuttiness of the roasted sweet potatoes, and the kick of cayenne is divine. 1 1/2 – 2 cups of mini marshmallows. 1. Preheat the oven to 350°. Set a sheet of aluminum foil on top of the middle rack. Rub the sweet potatoes all over with oil. Prick each one evenly on all sides with a fork. Roast the potatoes directly on top of the foil for about an hour, or until easily pierced with a paring knife. Remove the potatoes from the oven, and let them rest until they are cool enough to handle. 2. Split each potato lengthwise and peel the skin off of each half. Put the peeled potatoes in a large saucepan that can accommodate them all. Using a potato masher, mash the potatoes over gentle heat. With a wooden spoon, stir in the butter, maple syrup, cinnamon, salt and cayenne to taste. Continue stirring until the potatoes are smooth and hot. 3. Spoon the potatoes into a 9 x 9 dish. * Top with the mini marshmallows. Bake the potatoes in the oven for about 10-15 minutes, or until the topping is nice and browned. Alternatively, you could also place the dish under the broiler and broil the top until the marshmallows are toasted. You can make the dish ahead too. 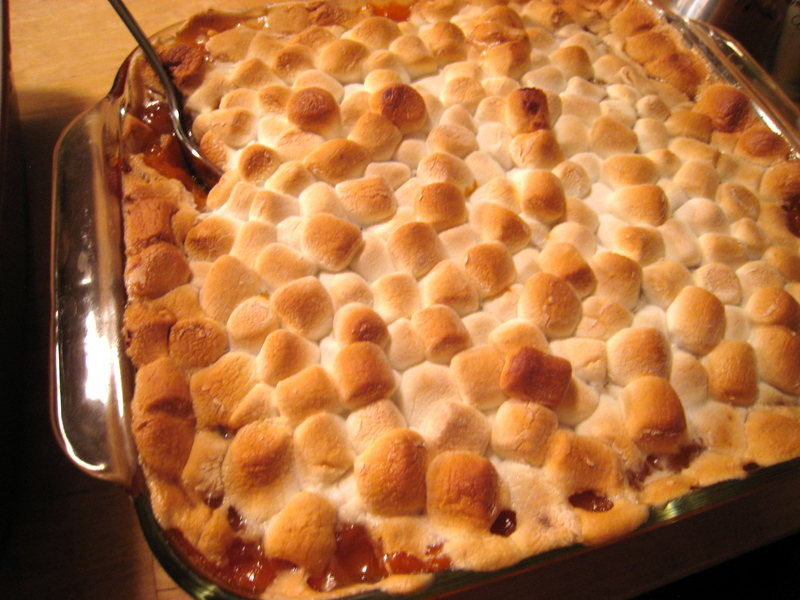 Bring the mashed sweet potatoes up to room temperature before topping it with the mini-marshmallows. Reheat the dish in the oven until the potatoes are hot and the marshmallows are browned, about 20 minutes at 350°.